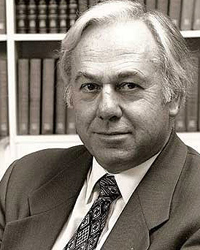 Prof. David Barker trained as a physician at Guy’s Hospital, London, and thereafter at the Queen Elizabeth Centre in Birmingham. He spent 3 years in Uganda at Makerere University, returning to Britain to join the newly founded medical school at Southampton. He is a Consultant Physician and former Director of the Medical Research Council Environmental Epidemiology Unit. Over the past twenty years he has carried out a series of studies showing that people who had low birthweights, or who were thin or stunted at birth, have high rates of coronary heart disease and the related disorders stroke, diabetes and hypertension in adult life. This has led to the hypothesis that coronary heart disease originates through under-nutrition in the womb. The undernourished baby changes its structure, physiology and metabolism. These changes tend to persist through life. These findings have important implications for public health, in understanding the reasons why the incidence of so-called Western disease changes so rapidly, and why rates of these diseases differ between rich and poor people. They suggest a new strategy for the prevention of Western disease, which will focus on the nutrition of young women and their babies as well as the lifestyles of men and women in middle age. There is now sufficient evidence for public health policies to be implemented. These include the avoidance of excessive thinness or overweight in mothers before conception; access to a balanced diet for all young women; protection of infant growth; and avoidance of overweight among young children who had small body size at birth. The Barker Early Origins Hypothesis, also known as the fetal origins hypothesis or the thrifty phenotype hypothesis is founded on the concept that intrauterine growth restriction (IUGR) or fetal growth restriction -due to nutritional deprivation in early life is an important cause of some of the most common, costly and disabling medical disorders of adult life such as coronary heart disease (CHD) and the related disorders such as hypertension and type-2 diabetes. Barker first put forth his hypothesis in 1986. His research group was puzzled that coronary heart disease (CHD) was the most common cause of death among certain men who otherwise had low risk characteristics, i.e., they were slim, non-smokers, and had low blood cholesterol. This suggested that the etiology of CHD needed further exploration. It was this extensive work which led to the development and study of the “Barker Early Origins Hypothesis”. Since then dozens of large-scale epidemiological and experimental studies conducted in Europe, USA, Asia and elsewhere have convincingly demonstrated a powerful link between IUGR as reflected in low birth weight and increased risk of developing chronic disease in later life. But today there is clear evidence that also obesity, asthma and obstructive lung disease originate in utero; and emerging evidence that cancers from the breast, ovary and prostate, osteoporosis, polycystic ovary syndrome, and mental disorders including schizophrenia and depression all originate in utero. Evidence extending this list frequently appears. The Barker hypothesis suggest a new strategy for the prevention of ‘Western’, disease, which will focus on the nutrition of girls and young women and their babies as well as the lifestyles of men and women in middle age. According to Professor Barker public health policies should include: the avoidance of excessive thinness or overweight in mothers before conception; access to a balanced diet for girls and young women through childhood, adolescence, early adult life and pregnancy, protection of infant growth and avoidance of overweight among young children who had small body size at birth.